Charming and clever coming-of-age story. This charming piece of Americana is not what we imagine as typical William Wellman fare, if it is possible to imagine such a thing. The Happy Years lacks the curious tension that marks much of his work. In fact, it’s a relaxed, easygoing, quietly amiable film. 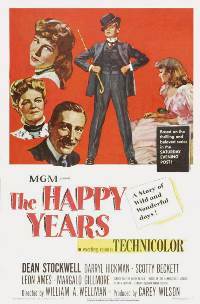 Set in 1896, The Happy Years tells the story of precocious but underachieving and incorrigible John Humperdink Stover (Dean Stockwell), who’s sent by his exasperated parents to boarding school. The film is based on a series of short stories by Owen Johnson and gives the feeling of being composed of several related vignettes rather than a single narrative. However, The Happy Years does have a single, unifying character arc. It’s a prototypical example of a coming-of-age story. Stover, or “Dink” as his classmates dub him, begins the film as a social menace. He remains isolated when he first arrives at boarding school, resisting all attempts to fit into the society of the school and, indeed, any society at all. Through a series of foibles and adventures, Dink matures from an obnoxious “little varmint” into an honorable and—if not exactly matured—maturing youth, one who is accepted into the society of his family and the school. Many of the scenarios in the film we’ve seen play out in other stories. For example, when Dink intends to cheat on an assignment, he finds that he’s actually learned the information. I know that scenario formed the basis of an episode of Growing Pains, and I’m sure I’ve seen it elsewhere before. However, it’s possible that, with many of these familiar situations, The Happy Years initiated them, so, when the movie came out, they were fresh. But, then again, tales of school years had been common for a hundred years by the time The Happy Years was made, so perhaps not. Nevertheless, the film executes its tale in a winning and clever fashion. Stockwell is an engaging young actor with a twinkle in his eye. In this film, he will prove barely recognizable to viewers who know him only as a hollow-faced and moody young man or the craggy aging one. Darryl Hickman, also a successful child actor, plays Dink’s rival, “Tough” McCarty. Hickman is very good, but he was 18 when he played the role and looks it. While 18 is not particularly old for an actor playing the role of a youth, Hickman looks significantly older than the 14-year-old Stockwell, who still had a baby face and short stature. In the film, Tough looks like he should be off chasing girls (or whatever 18-year-olds do) and not fooling around with boyish hijinks. The standout performance of the movie, however, belongs to Leo G. Carroll, as “The Old Roman,” the boys’ severe, yet sympathetic Latin teacher. Although quieter and statelier, Carroll’s performance is similar to Lou Gossett, Jr.’s Oscar-winning performance in An Officer and a Gentleman. Both play authority figures whose austere demeanors contrast with their supportive intentions. Carroll has the difficult task of portraying his character so that the perception of the Old Roman is believably different to his students than it is to the audience. Unfortunately, throughout his career as one of classic filmdom’s most reliable character actors, Carroll never received an Oscar nomination. He certainly deserved one here. One of William Wellman’s most peculiar idiosyncrasies as a director was to block the characters’ faces during scenes of emotional import. However, in this film, he chooses a diametrically opposite approach, choosing to shoot the most emotional moments for the characters in full-face shots. With young actors, this technique is challenging. There’s no way for directors or editors to hide performance flaws. The full-face shot is unforgiving; it captures everything, emphasizing every minute change in expression. Even for viewers, this type of shot can be uncomfortable. The characters are laid open to us; there’s nowhere to hide. But, in this film, the choice works. It reflects the openness of youth, a time before people learn to guard their emotions from the world. And the film is populated with young actors who are capable of handling that type of shot. Nothing in The Happy Years is fresh. Viewers will have seen much of this narrative and thematic material before. It’s not a film for viewers who are looking for innovation or edginess. Yet, the clever and deft execution of delightful, good-natured material will please viewers who are not too cynical to enjoy it. Must admit this isn’t one of my favourites by Wellman, but it certainly has its moments and you’ve done a great job here! I don’t know if I’d realised that the rival was 4 years older than Dean Stockwell. I also like Leon Ames as his dad – he is so good at that type of role, as in ‘Meet Me in St Louis’. You neglected to mention that Dean’s brother, Guy, played an extra young hooligan in the film, also a contracted young actor with MGM.